This exclusive KC winery tour starts at the Cellar Rat Wine Merchant, a select purveyor in local and foreign wines. After meeting your affable, friendly driver/guide and partaking in a short, optional tasting, you will head to the minibus for a short drive to you first official winery location. 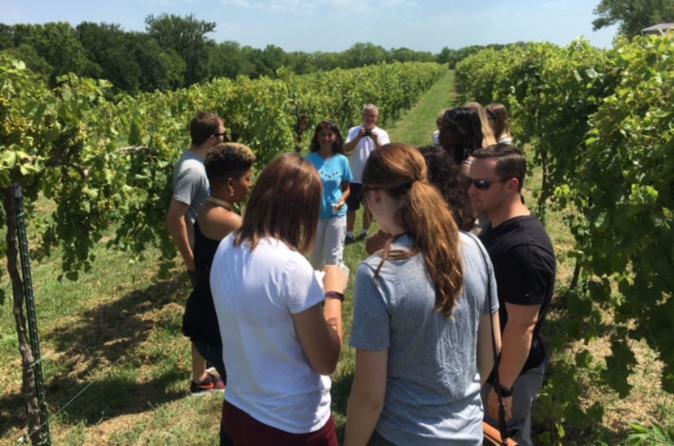 The tour operator maintains partnerships with an ever-expanding portfolio of wineries and producers located within and around Kansas City and rotates among three select establishments to ensure variety and diversity throughout the trip. At each stop, you will taste a minimum of three different wines - both red and white - with additional pourings available at select locations. If you find something you want to take home, go ahead and purchase it! Each vehicle comes with a shared cooler holding water and small snacks and space to store wine throughout the day.